This article is about the religious author. For operatic soprano, see Karan Armstrong. 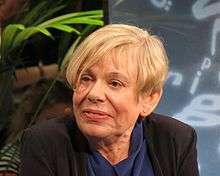 Karen Armstrong OBE FRSL (born 14 November 1944) is a British author and commentator known for her books on comparative religion. A former Roman Catholic religious sister, she went from a conservative to a more liberal and mystical Christian faith. She attended St Anne's College, Oxford, while in the convent and majored in English. She became disillusioned and left the convent in 1969. She first rose to prominence in 1993 with her book A History of God: The 4,000-Year Quest of Judaism, Christianity and Islam. Her work focuses on commonalities of the major religions, such as the importance of compassion and the Golden Rule. Armstrong received the US$100,000 TED Prize in February 2008. She used that occasion to call for the creation of a Charter for Compassion, which was unveiled the following year. Armstrong was born at Wildmoor, Worcestershire, into a family of Irish ancestry who, after her birth, moved to Bromsgrove and later to Birmingham. In 1962, at the age of 18, she became a member of the Sisters of the Holy Child Jesus, a teaching congregation, in which she remained for seven years. Armstrong claims she suffered physical and psychological abuse in the convent; according to an article in The Guardian newspaper, "Armstrong was required to mortify her flesh with whips and wear a spiked chain around her arm. When she spoke out of turn, she claims she was forced to sew at a treadle machine with no needle for a fortnight." Once she had advanced from postulant and novice to professed nun, she enrolled in St Anne's College, Oxford, to study English. Armstrong left her order in 1969 while still a student at Oxford. After graduating with a Congratulatory First, she embarked on a DPhil on the poet Tennyson. According to Armstrong, she wrote her dissertation on a topic that had been approved by the university committee. Nevertheless, it was failed by her external examiner on the grounds that the topic had been unsuitable. Armstrong did not formally protest this verdict, nor did she embark upon a new topic but instead abandoned hope of an academic career. She reports that this period in her life was marked by ill-health stemming from her lifelong but, at that time, still undiagnosed temporal lobe epilepsy. Around this time she was lodged with Jenifer and Herbert Hart, looking after their disabled son, as told in her memoir The Spiral Staircase. In 1976, Armstrong took a job teaching English at James Allen's Girls' School in Dulwich while working on a memoir of her convent experiences. This was published in 1982 as Through the Narrow Gate to excellent reviews. That year she embarked on a new career as an independent writer and broadcasting presenter. In 1984, the British Channel Four commissioned her to write and present a television documentary on the life of St. Paul, The First Christian, a project that involved traveling to the Holy Land to retrace the steps of the saint. Armstrong described this visit as a "breakthrough experience" that defied her prior assumptions and provided the inspiration for virtually all her subsequent work. In A History of God: The 4,000-Year Quest of Judaism, Christianity and Islam (1993), she traces the evolution of the three major monotheistic traditions from their beginnings in the Middle East up to the present day and also discusses Hinduism and Buddhism. As guiding "luminaries" in her approach, Armstrong acknowledges (in The Spiral Staircase and elsewhere) the late Canadian theologian Wilfred Cantwell Smith, a Protestant minister, and the Jesuit father Bernard Lonergan. In 1996, she published Jerusalem: One City, Three Faiths. Armstrong's The Great Transformation: The Beginning of Our Religious Traditions (2006) continues the themes covered in A History of God and examines the emergence and codification of the world's great religions during the so-called Axial age identified by Karl Jaspers. In the year of its publication Armstrong was invited to choose her eight favourite records for BBC Radio's Desert Island Discs programme. She has made several appearances on television, including on Rageh Omaar's programme The Life of Muhammad. She was an advisor for the award-winning, PBS-broadcast documentary Muhammad: Legacy of a Prophet (2002), produced by Unity Productions Foundation. In 2007 the Islamic Religious Council of Singapore invited Armstrong to deliver the MUIS Lecture. Armstrong is a fellow of the Jesus Seminar, a group of scholars and laypeople which attempts to investigate the historical foundations of Christianity. She has written numerous articles for The Guardian and for other publications. She was a key advisor on Bill Moyers' popular PBS series on religion, has addressed members of the United States Congress, and was one of three scholars to speak at the UN's first ever session on religion. She is a vice-president of the British Epilepsy Association, otherwise known as Epilepsy Action. Awarded the $100,000 TED Prize in February 2008, Armstrong called for drawing up a Charter for Compassion, in the spirit of the Golden Rule, to identify shared moral priorities across religious traditions, in order to foster global understanding and a peaceful world. It was presented in Washington, D.C. in November 2009. Signatories include Queen Noor of Jordan, the Dalai Lama, Archbishop Desmond Tutu and Paul Simon. Armstrong commented on comedian Bill Maher's criticism of Islam by telling Salon "this is the sort of talk that led to the concentration camps in Europe. This is the kind of thing people were saying about Jews in the 1930s and ’40s in Europe." Maher responded to Armstrong's comments by telling Vanity Fair, "It’s beyond stupid. Jews weren’t oppressing anybody. There weren’t 5,000 militant Jewish groups. They didn’t do a study of treatment of women around the world and find that the Jews were at the bottom of it. There weren’t 10 Jewish countries in the world that were putting gay people to death just for being gay. It’s idiotic." After that Armstrong reiterated her criticism of Maher by telling The New York Times, "My problem with some current critics of Islam is that their criticism is neither accurate, fair, nor well-informed. I am sure they do not intend this, but in the 1930s and ’40s in Europe, we learned how dangerous and ultimately destructive this kind of discourse could be." In 1999 Armstrong received the Muslim Public Affairs Council's Media Award. Armstrong was honoured by the New York Open Center in 2004 for her "profound understanding of religious traditions and their relation to the divine." She received an honorary degree as Doctor of Letters by Aston University in 2006. In May 2008 she was awarded the Freedom of Worship Award by the Roosevelt Institute, one of four medals presented each year to men and women whose achievements have demonstrated a commitment to the Four Freedoms proclaimed by President Franklin D. Roosevelt in 1941 as essential to democracy: freedom of speech and of worship, freedom from want and from fear. The institute stated that Armstrong had become "a significant voice, seeking mutual understanding in times of turbulence, confrontation and violence among religious groups." It cited "her personal dedication to the ideal that peace can be found in religious understanding, for her teachings on compassion, and her appreciation for the positive sources of spirituality." She has also received the TED Prize 2008. In 2009 she was awarded the Dr. Leopold Lucas Prize by the University of Tübingen. Armstrong was honored Nationalencyklopedin's International Knowledge Award 2011 "for her long standing work of bringing knowledge to others about the significance of religion to humankind and, in particular, for pointing out the similarities between religions. Through a series of books and award-winning lectures she reaches out as a peace-making voice at a time when world events are becoming increasingly linked to religion." On 30 November 2011 (St. Andrew's Day) Armstrong was made honorary Doctor of Letters by the University of Saint Andrews. On 3 June 2014, she was made honorary Doctor of Divinity by McGill University. Armstrong has been called "a prominent and prolific religious historian" and described as "arguably the most lucid, wide-ranging and consistently interesting religion writer today". Juan Eduardo Campo, author of the Encyclopedia of Islam (Encyclopedia of World Religions) (2009), included Armstrong among a group of scholars whom he considered as currently conveying a "more or less objective" (as opposed to polemical) view of Islam and its origins to a wide public in Europe and North America. She is a regular speaker on the Abrahamic tradition; in the last decade increasing interest in and debate surrounding Islamic issues has brought her even wider visibility. After the September 11 attacks she was in great demand as a lecturer, pleading for inter-faith dialogue. Atheist activist Sam Harris criticizes Armstrong's "benign" view of Islam, contending that "Islam, as it is currently understood and practiced by vast numbers of the world's Muslims, is antithetical to civil society." Harris is also strongly critical of Armstrong's "religious apology" of Islamic fundamentalism, accusing her and like-minded scholars of "political correctness." Armstrong has also attracted the criticism of Evangelical Christian philosopher and apologist William Lane Craig. In Craig's response to a debate between Armstrong and evolutionary biologist Richard Dawkins published in the 12 September 2009 issue of The Wall Street Journal, Craig criticizes Armstrong's "anti-realist" views about statements concerning God, particularly her assertion that "'God' is merely a symbol that points beyond itself to an indescribable transcendence." Craig argues that Armstrong's view of God as ineffable is "self-refuting" and "logically incoherent". Craig also disputes Armstrong's characterization of the religious views of early Christians. Her popular work on the crusades has not been well received by a number of academic crusade historians. 1 2 "Karen Armstrong on Sam Harris and Bill Maher: "It fills me with despair, because this is the sort of talk that led to the concentration camps"". Salon. 23 November 2014. ↑ Armstrong, Karen (2005). Through A Narrow Gate: A Memoir of Spiritual Discovery (Revised ed.). Macmillan. p. 7. ISBN 0-312-34095-8. ↑ "Karen Armstrong: The compassionate face of religion". The Guardian. 2 October 2010. 1 2 Armstrong, Karen. The Spiral Staircase: My Climb Out Of Darkness. New York: Random House, 2004. ↑ McGrath, Alister (2006). "Spirituality and well-being: some recent discussions". Brain. 129 (1): 278–282. doi:10.1093/brain/awh719. ↑ "The runaway nun". New Statesman. 5 April 2004. ↑ The Case for God, p. 283. ↑ "Desert Island Discs, February 12, 2006: Karen Armstrong". BBC Radio 4 Website. Retrieved 9 April 2008. ↑ Karen Armstrong Speaker Profile at The Lavin Agency, thelavinagency.com Archived 17 May 2008 at the Wayback Machine. ↑ Dave Weich, "Karen Armstrong, Turn, Turn, Turn". ↑ "Voices on Antisemtisim interview with Karen Armstrong". United States Holocaust Memorial Museum. 5 July 2007. ↑ The Charter for Compassion. ↑ "TEDPrize 2008 Winner :: Karen Armstrong". TEDPrize Website. Retrieved 19 March 2008. ↑ Chapman, Glenn (12 November 2009). "Online call for religions to embrace compassion". Agence France-Presse. Retrieved 12 November 2009. ↑ "Last Chance to Buy Your Tickets to MPAC Media Awards Gala on Sunday, June 1st". Muslim Public Affairs Council. Retrieved 25 December 2011. ↑ "Karen Armstrong". Westar Institute. Retrieved 25 December 2011. ↑ "Bill Moyers Journal, Karen Armstrong". Public Broadcasting Service (PBS). Retrieved 25 December 2011. ↑ "Open Center Gala Honorees". 2009. Retrieved 9 October 2009. ↑ "Honorary Graduates of the University". Aston University. Retrieved 25 December 2011. ↑ "The Franklin D. Roosevelt Four Freedoms Awards: Freedom of Worship: Karen Armstrong". Four Freedoms Award website. Franklin and Eleanor Roosevelt Institute. 2008. Retrieved 28 June 2008. ↑ "2008 Winners". TED Prize. Retrieved 25 December 2011. ↑ Armstrong, Karen. (2010). Plädoyer für Gott. Tübingen: Mohr Siebeck. p. 108. ISBN 978-3-16-150305-4. ↑ "Intervju med Karen Armstrong". The Knowledge Awards. Retrieved 25 December 2011. ↑ Bonos, Lisa (16 January 2011). "Review of Karen Armstrong's "Twelve Steps to a Compassionate Life"". Washington Post. Retrieved 21 May 2011. ↑ Miller, Laura. ""Buddha" by Karen Armstrong". Salon. Retrieved 21 May 2011. ↑ Juan Eduardo Campo (November 1996). "Review of [Muhammad and the Origins of Islam] by F. E. Peters". International Journal of Middle East Studies. 28 (4): 597–599. doi:10.1017/s0020743800063911. 1 2 Harris, Sam (5 May 2008). "Losing Our Spines to Save Our Necks". The Huffington Post. Retrieved 21 May 2014. ↑ Armstrong, Karen; Dawkins, Richard (12 September 2009). "Man vs. God". The Wall Street Journal. Retrieved 21 May 2014. ↑ McGirr, Michael (10 October 2014). "Book Review: Battling with the evils of humanity". The Sydney Morning Herald. Retrieved 19 October 2014. The reason of faith Ode magazine, 2009. Booknotes interview with Armstrong on Islam: A Short History, 22 September 2000.